Enjoy excellent value at the Courtyard San Antonio SeaWorld /Lackland and discover the comfort of hotel rooms and suites with host of amenities. 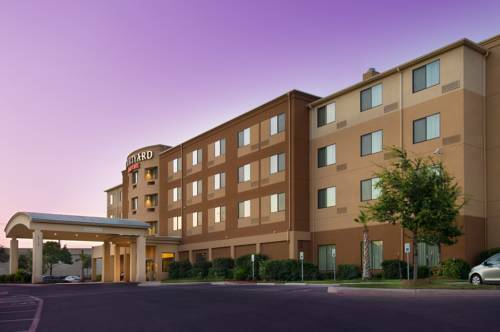 Conveniently located near SeaWorld , Lackland AFB, San Antonio Missions an UNESCO World Heritage Site, Port San Antonio, the Riverwalk and other top destinations, our hotel pampers guests with the convenience and comfort of free Wi-Fi, a large work area, premium movie channels, flat screen TVs and Marriott luxury bedding. Meet up with friends or associates in our spacious lobby filled with comfortable seating and media access along with a business center and The Bistro where breakfast and dinner menus are served as well as Starbucks beverages and evening cocktails. For larger gatherings, our hotel's meeting room accommodates up to 40 persons and is ideal for small San Antonio business or social events. Other on-site amenities include an indoor pool and fitness center. We look forward to welcoming you to the Courtyard San Antonio SeaWorld /Lackland!